jonnyontheroad: Dokdo Rocks! and rubber bands. Two questions have immediately come to your mind: "Why?" and "What the hell is Dokdo?" 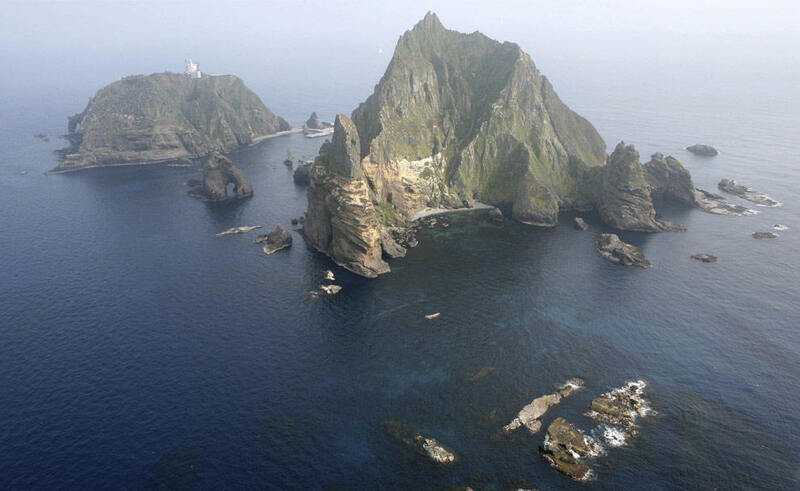 To answer your second question, Dokdo is Korea's name for two rocks, also called the Liancourt Rocks and Takeshima, in the middle of the Sea of Japan (or the East Sea, Korea's name for the Sea of Japan. They love re-naming things). As the NY Times ad above illustrates, the islands have been disputed territory with Japan for just about all of eternity. You can catch up on Dokdo's disputed history here. The first question is the better one. If you ask this of your friends in Japan, they will probably answer with the second question ("What the hell is Dokdo?"). Even if they have heard the islands called by their Japanese name, Takeshima, they likely didn't hear much else about it. From the Japanese people and residents I've talked to, very few care about Dokdo/Takeshima at all. On the Japanese side of the dispute, the matter seems to be entirely political. On the Korean side, however, politics is the least of it. Sure, there is economic potential in Dokdo as a commercial fishing outpost and a theoretical source of gas deposits. But for most Koreans, Dokdo has become a symbol of the entire country and its long history of fighting against colonial and imperial powers. It's almost as if South Koreans wouldn't know what to do if they weren't battling for something. So they've adopted the political fight for Dokdo as a very personal one. The author of this 2006 San Francisco Chronicle article about the "Dokdo bikers" was, in my opinion, spot on in his assessment of Korean pride over the dispute. The conflict is partly over fishing rights and sea boundaries, but deeper down, Korean passion is fueled by enduring bitterness over Japan's harsh, 35-year occupation of Korea that ended in 1945 with Japan's defeat in World War. According to the Korea Times article, the bracelets read "Dokdo is Korean Territory" and "East Sea is Korea", and will be distributed in NY and NJ. KALA co-chair Hwang Sung-Ho compares Dokdo to the Falkland Islands in the article, complaining that Americans know about the latter but nothing of the former. Seriously? First of all, the the Falkland Islands are 65,000 TIMES LARGER than Dokdo (Dokdo is 187,500 square meters, while the Falkland Islands cover 12,173 km2, or 12 billion square meters), people actually LIVE there, and there was a war fought specifically about the territory. Secondly, though some Americans might recognize the name "Falkland Islands", I doubt they could tell you anything about them. Comparing Dokdo to any other islands, territories, or land under dispute anywhere else in the world is just asking to be criticized. Brian Deutsch brought up this argument on his blog after the 30-second ad for Dokdo aired in Times Square on March 1st. The ad, though rather clever I think, serves only to draw attention to the differences between the islands rather than similarities. And as Brian pointed out, the ad's comparisons would never normally point to Dokdo as a logical conclusion here. I'd be absolutely shocked if you answered anything other than Jeju. Jeju, Korea's largest island, is a frequent vacation and honeymoon destination for Koreans. Dokdo is not. (Although Dokdo once played host to a wedding, the event was more of a protest to Japanese claims on the island than to celebrate the atmosphere of the rocks.) Though the islands receive over 100,000 visitors each year, they are overwhelmingly Korean, and they do little more than set foot on a closely guarded visitor area. This dispute is likely to continue until both countries bring the issue to the International Court of Justice, as Japan has suggested. Korea rejected the proposal. - Japan has claimed ownership of the Rocks, designating them Takeshima under Okinoshima, Oki District, Shimane Prefecture. 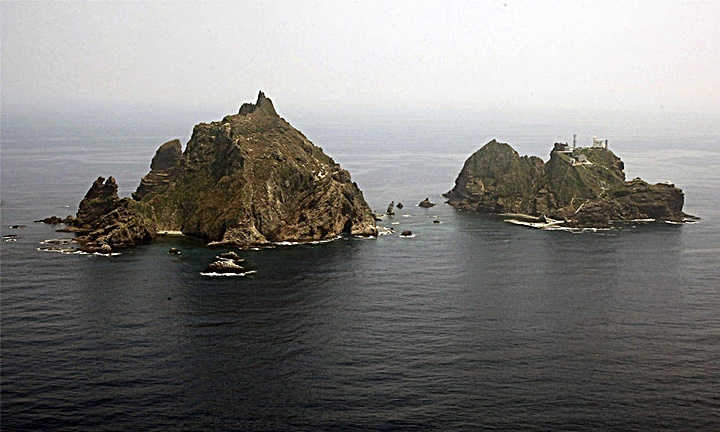 - Korea has claimed ownership of the Rocks, designating them Dokdo (Dok-do, Tokto) under Ulleung-eup, Ulleung County, North Gyeongsang Province. - Due (in part) to historical political strife, as of today (2010/MAR/02), the two countries have not resolved the issue of ownership of the Rocks between themselves. - Since both nations list the islands as part of their respective countries, the Rocks are disputed territory. - While the Liancourt Rocks are currently administered by the Republic of Korea, as we all know, possession DOES NOT necessarily equal ownership. - Japan has indicated that they are willing to settle this matter in international court. Korea has indicated that they do not. Therefore, the matter is neither resolved internally between the two countries, nor externally in international law. Those are the facts. All the facts point to the Liancourt Rocks being disputed territory. Anything else - including personal beliefs - would be incorrect. My question to you is - did you start wearing one of the wrist bands? And where can I get one to show my worldwide support for this infinitesimal issue? Have you gotten any hate mail from this yet? Please post if you do. I love Dokdo and every discussion I've ever had about it because it absolutely tickles me. Who is the yellow journalist who wrote this article? Koreans cut off their fingers and decapitated pheastants? I think one nutbar cut off a digit and the pheasants were butchered by a bunch of radical former ROK soldiers. Stop making such bizarre generalizations blogmaster!!! You want facts? Here’s your facts. Japan officially declared both Dokdo (Matsushima 松島) and Ulleungdo (竹島-Takeshima) as outside of her Japan in the year 1995. Japan issued a travel ban on both Dokdo (Matsushima 松島) and Ulleungdo (竹島-Takeshima) in the year 1837 and described Dokdo as part of Chosun (Korea). Japanese map always excluded Dokdo from part of Japan. Japan’s only claim to Dokdo was a military annexation during the Russo-Japanese War (1904~1905) and an inseparable part of the colonization of Korea. Japan has zero historical claim to Dokdo. Japan’s only claim to Dokdo was an expansionist colonial era land grab undertaken at the height of the largest war of the day (Russo-Japanese War 1904~1905) This act was an inseparable part of Japan’s colonization of Korea. @anonymous You're right, the generalization was not fair, and I changed it. But I think those specific incidents are important to note, because they do highlight how fiercely Koreans defend this issue. There are crazy people everywhere, and their beliefs don't necessarily reflect the attitudes of the general population. But in this case, their stunts are indicative of a less fanatical, but still very large, and very emotional, base of support. I assume this was a typo, but the Tottori-Bafuku records were from 1695, not 1995. For what it's worth, I do believe that Dokdo belongs to Korea based on historical evidence. (I thought I had included a link to the dokdo-takeshima website in this post, but that was my mistake.) That's what makes *some* Koreans behavior, and most Koreans' attitudes towards Dokdo interesting and rather amusing. With the evidence in Korea's favor, why not take the issue to the ICJ as Japan has suggested? lol. Writing about disputed Korean territory or history always brings out the nuts.